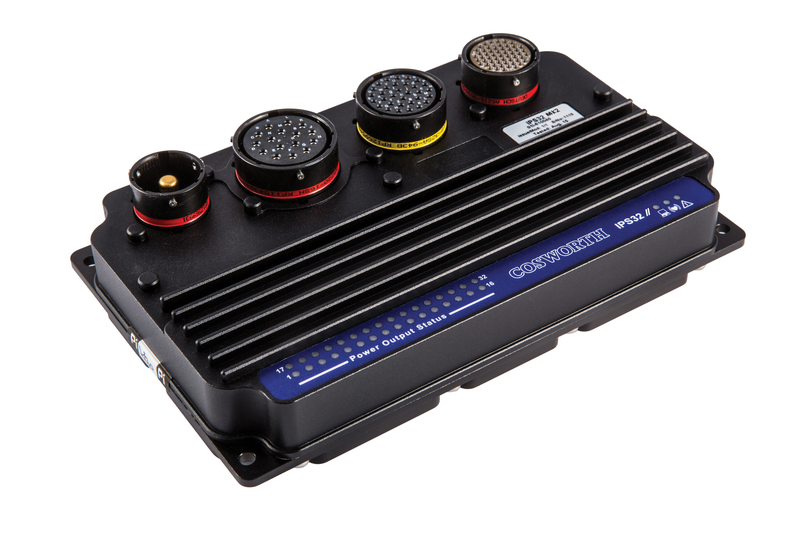 The IPS32 is the third generation of electrical power management system developed by the electronics team at Cosworth, using solid state power devices to upgrade and replace traditional DC fuses and circuit breakers, with the benefit of simplified wiring and better control of power consumers. Making the unit programmable via onboard intelligence combined with CAN messages enables breakers to be reset automatically and failure modes to be defined enabling a car to be as resilient as possible on the punishing conditions encountered on any racing stage. Designed to drive a wide range of electrical loads, each of the 32 outputs has user-defined trip limits including reset, onboard math-based control strategy, and a measurement of the current and voltage. The unit supports high speed (20Khz) pulse width modulation (PWM) enabling very precise control of power to items such as an electric motor or to modulate an ECU input. Enclosed in a high quality anodised aluminium box and sealed to IP65, there are indicator LED’s for all 32 outputs, together with “heartbeat”, comms and trip status. The IPS32 is configured using Cosworth’s latest ‘Toolset’ PC software where the user is able to combine any physical input and/or CAN channel to form a control strategy for each power output. Features such as auto start, light sequences, pump control and limp home strategies are all now possible. Toolset is also used to communicate with and configure Cosworth’s latest generation ICD TFT and D4 LCD dash/loggers and L2 logger. The IPS32 has the ability to run on 12v or 24v systems with overvoltage and load dump protection as standard, and integrates a powerful built-in diagnostics logger making the IPS32 a true standalone intelligent power control system.